Google Earth 7.3.0.3832 blowin’ up in Linux Mint. I did some research, tried safe mode, checking that all dependencies were satisfied and different video drivers. This was happening on any machine I installed on so I knew it wasn’t hardware. 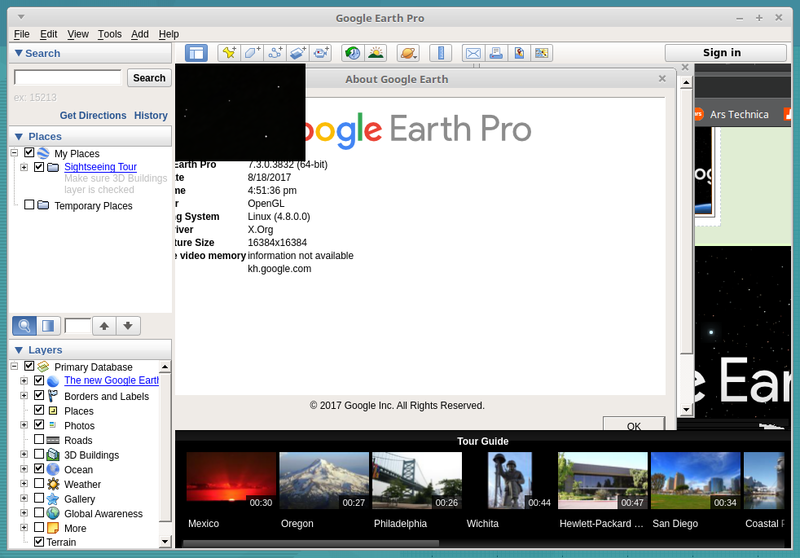 Google Earth Pro 7.1.8.3036 working in Linux Mint 18.2. Life is good again. Unless that’s your RV. The same problem still exists and the same solution still applies. Use version 7.1.87.3036. Caution! If you perform a ‘sudo apt update/upgrade from the command prompt, GE will get updated to the newer non-functioning version. If that happens, use Synaptic Package Manager to completely remove GE then reinstall using the .deb file you downloaded earlier (and hopefully saved). When update manager prompts you to update, right-click and select ‘ignore …’. 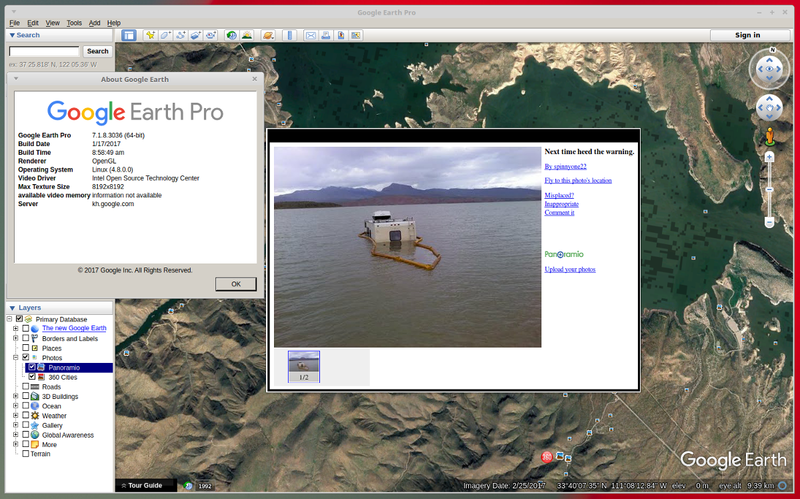 Also go into SPM and type google earth in the search bar. Left-click it once and click Package > Lock Version. This will prevent Update Manager or Synaptic from accidentally upgrading you to the newer non-working version, however, performing a sudo apt upgrade from the command prompt will still force the upgrade. Installing GE 7.1.87.3036 is the best solution for Mint 18.3. With the other choices using the Software Manager, and using direct .deb download and installing with a terminal my screen looked exactly like your first one at the top of the article. Thanks for leading the way to an easy solution. FINALLY! Have tried what feels like dozens of routes to get this working again and all it took was this — thank you and well done. Thanks for the information….It works great. Worked for me so far, thanks! FWIW I’m running 18.2 and same solution applies. I did get a dire warning which I ignored.